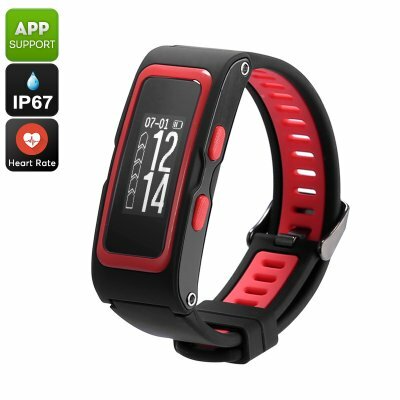 Successfully Added Fitness Tracker Bracelet - Heart Rate, Pedometer, GPS, IP67 Waterproof, Real-Time Altimeter, Pressure, Temperature (Red) to your Shopping Cart. This fitness tracker bracelet is the ultimate gadget for those of you that enjoy outdoor activities. What really sets this health gizmo apart from the rest is the fact that it comes with an abundance of sensors. Thanks to this, it provides you with accurate data on the temperature, air pressure, and height of your current location. These features will come in particularly handy for all outdoor enthusiasts out there. With its 220mAh battery and IP67 waterproof design, you’ll be able to use this gizmo in all weather conditions for days in a row. Naturally, your smart fitness bracelet also treats you to all basic health features. With its pedometer, it keeps accurate track of the number of steps you took throughout the day. This makes it easy for you to meet your daily exercise goals. Additionally, a heart rate monitor is in place that lets you analyze your heart rate during upcoming workout sessions. A sedentary reminder makes sure you’ll never miss a single workout session again whereas its target setting guides you in meeting your future fitness goals. Through Bluetooth 4.2, this fitness tracker is compatible with both iOS and Android phones. The Bluetooth watch itself comes with a removable strap that can be easily replaced. On its 0.96-Inch LCD display, it treats you to sharp visual at any time of the day. Thanks to all its high-end outdoor and sports features, this bracelet is guaranteed to meet all your fitness demands.